Hong Kong is extreme human-ness – utter contrast to the wild nature of the jungle of Taman Negara I’d just left – densely populated, massive high rises and smog hovering persistently. I found it exciting and compelling despite its hyper unnaturalness. There is poverty of personal space in Hong Kong; there simply isn’t room for any. High population in a very small space = small apartments, people walking close in a crowd, stand close in a queue, NEVER a spare seat next to yours on public transport. Crowds swell around you constantly on the streets, stations and buses, not threatening, just there and near. I got used to the lull of it and being part of humanity moving in collective tides. Hong Kong is very British, which sadly I found strangely reassuring at this stage. Well I’d had a few challenges and at this stage I welcomed a soiree back into something closer to my comfort zone. Other languages, not knowing your way round, every encounter and arrangement a challenge of understanding a different culture… that’s all very well, but at this stage I was a bit exhausted! 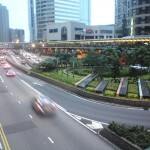 In HK they drive on ‘our’ side of the road, street signs are the same, traffic rules – even ambulances make the same noise! Oh the stupid delight I got from ambulances making the same noise! I digress. My Dad lived here from 1956-1959 as a lieutenant in the Royal Engineers of the British army and I had a few more clues about his time here than in Malaysia/Malaya. When he was a young man, before he met Margie, he had trained at RADA (Royal Academy of Dramatic Arts) where he qualified with a diploma in 1950. He always wanted to be an actor and was very good I think. 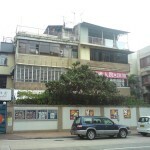 In Hong Kong he directed and produced an outdoor production of ‘A Midsummer Night’s Dream’. I remember him telling me about this and found a programme for it after he died, which also had his old address on it! 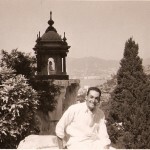 Hong Kong was also where he came closest to ‘making it’ – in that it was here that he got a small part in an Orson Welles film being filmed there at the time -‘Ferry to Hong Kong’ – released by Rank in 1959. 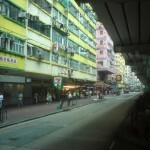 The film shows a very different Hong Kong. It tells the tale of a drunken European anti-hero who is deported by the British from Hong Kong to mainland Macau. Orson Welles is the snobby captain of the ferry who is compelled to take the scruffy hero across. 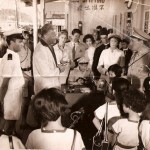 My Dad played the Portuguese officer who turns the hero away at Macau, starting the trajectory of the movie with the hero spending the rest of the film stuck on the ferry, going to and fro between Hong Kong and Macau, not allowed to disembark at either. For my Dad, as they say in the trade, a small-but-important part, and sharing his only few lines ever in film with Orson Welles, not bad really! Again I’m not really sure what my Dad was doing in Hong Kong in terms of his army role. Hong Kong was a British colony then, recovering from Japanese occupation during WW2 but there was not much else going on in terms of military threat or activity, which may have been a relief for my Dad after being in a war situation in Malaya. Hong Kong is an exciting and dynamic place with a lot of beauty and maybe my Dad simply had some time to enjoy this and pursue some of the things he really wanted to do. However Hong Kong is a vastly different place to the late 50’s. Its population is more than 6 times greater and it has had enormous economic growth and success. I found a letter to my father from a friend in Hong Kong after he’d moved to Canada and recently married my Mum in which he writes: ‘People have quite given up saying “It can’t go on.” It does, and continues to prosper.’ And that was only 1963! 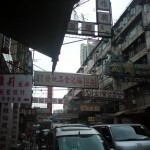 The Hong Kong my Dad knew disappeared a long time ago. I met the Hong Kong Players (formerly the Hong Kong Stage Club with whom my Dad produced Midsummer Night’s Dream over 50 years earlier.) Most of the members were British, HK has a strong British ex-pat population and I suspect the Hong Kong Players were pretty similar when my Dad was with them. They had no idea about anything to do with my Dad of course but were interested in my tale. I was told there was a scrapbook dating back to the 1950’s and 60’s somewhere but it couldn’t be turned up. I left them they were busy rehearsing and planning their Christmas panto, much as drama groups are doing all over the world at that time of year. A lot of the things my Dad remembered about Hong Kong are things that are iconic for many and are part of the tourist highlights now. The Peak Tram is one of the steepest funicular railways in the world (note, there is also one at Aberystwyth up Constitution Hill). This one takes you up the steep tree-covered slopes of Hong Kong Island to the cooler heights, where colonial mansions were built, now luxurious homes defended by razor wire. At the top of the railway there is a now an elaborate viewing platform and recently opened shopping complex. All the usual suspects including MacDonald’s. The Peak Café built in 1901 used to provide shelter to sedan bearers. Now it has been replaced by a very nice but very expensive restaurant called Peak Lookout. You can’t go back. 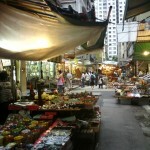 Similarly the Hollywood Road / ‘Antiques Street’ area and nearby Cat Street Market are still there, and still selling traditional Chinese antiques, art, jade, as well as newer small contemporary art galleries. But there is a self-consciousness about it – it’s a tourist area trying to preserve itself – because that is after all what tourists want, a sense of authenticity – but – at the same time raking it in. But HK would be nothing without capitalism. Capitalism has made and created it. 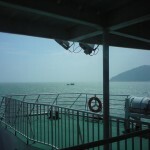 On my last day I HAD to go on the ferry to Hong Kong – the Hong Kong to Macau ferry that my Dad’s film was about. This is such a completely different ballgame to the 1959 experience that it defies comparison. However I did really enjoy myself. Then, the old tatty ferry would have taken about a day to cover the distance between the 2 colonial posts, HK British, Macau Portuguese. Now they are linked by high speed hydrofoil ships which make the journey just over an hour, and go so fast there is no deck you can go out on it’s too dangerous! However this did make it possible for me to do the round trip in a morning on my last day! Goodness knows what the people thought of me getting off the ferry, going through passport control to mainland China and back through immediately onto the same ferry going back, but I didn’t care! I was looking out for a dashing and obstructive official but no one struck me like my Dad! It was nice to get a sense of Hong Kong from the sea, which is how it came to be. The island was a crucially important port for the British on the coast of China, why it was fought over so hard. I saw ocean liners, ferries and even small boats like the junks of the river people of the past who barely exist now. It was good feel the swell of the sea, to get out from under the smog for a bit and see blue sky. 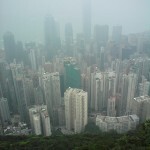 When I left Hong Kong I felt sad. 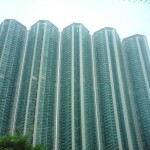 Leaving Hong Kong marked the end of this part of my journey which was mostly about searching for my Dad. And my Dad’s Malaya, my Dad’s Hong Kong – and my Dad – are not here. He’s gone – the memories, stories, what it all meant to him, the questions I could have asked him, the conversations we could have had – our time has run out. So it was with some grief I left that colourful vibrant place that I know my father loved. My Dad made the journey by boat to Vancouver and from there by bus across Canada to Toronto where he eventually met my Mum and had a family (and me and my Dad’s acquaintance began). A friend of my Dad’s always laughed that my Dad was the only British person he knew in Canada who had never crossed the Atlantic. I was taking a flight which perversely took off at 11pm one night, took blooming hours and landed 3 hours earlier on the same day! Go east to the west.